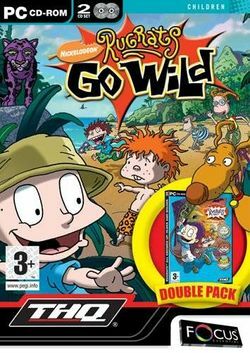 Rugrats Go Wild Double Pack is a compilation game that was released by Focus Multimedia for the Microsoft Windows operating system on October 6, 2006. As the game's name implies, it features the Windows version of Rugrats Go Wild (2003) which, like the movie it was based on, featured characters out of Klasky-Csupo's third Nickelodeon cartoon The Wild Thornberries, along with Windows-exclusive Rugrats: All Growed Up (2001), which featured the characters as teenagers. This page was last edited on 25 November 2016, at 22:51.